There are just those days when you don’t have a lot of time or a lot of ingredients in the house but you need to get dinner on the table stat! I was having one of those days this past Friday in Bristol. I was out at Toyota Pit Pass, hanging with the fans and giving away autographed KB hats, when I got a text that Kyle needed food in a hurry. On the golf cart ride back to the bus, I pulled up a recipe I pinned called Ramen Noodle Stir Fry. I thought, well, that sounds good! However, when I pulled up the full recipe, it required about 20 odd ingredients and a lot of prep time. No thanks, I don’t have time for that! So when I got back to the bus, I made my own version with around five ingredients and in only 15 minutes. First, I cut a chicken breast into bite-size chunks and put it in a pan with a little olive oil, garlic salt and pepper. 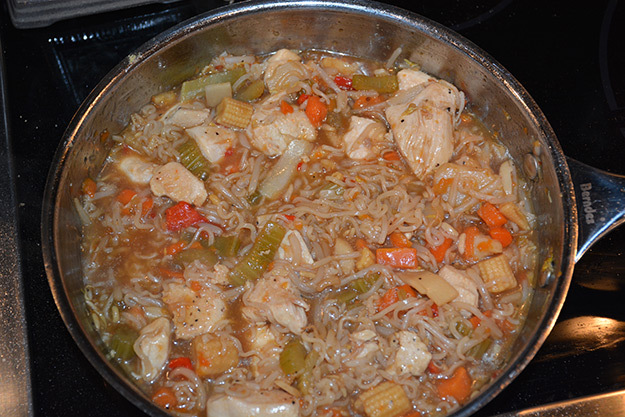 While that was cooking, I made the ramen noodles without adding the packet of seasoning. 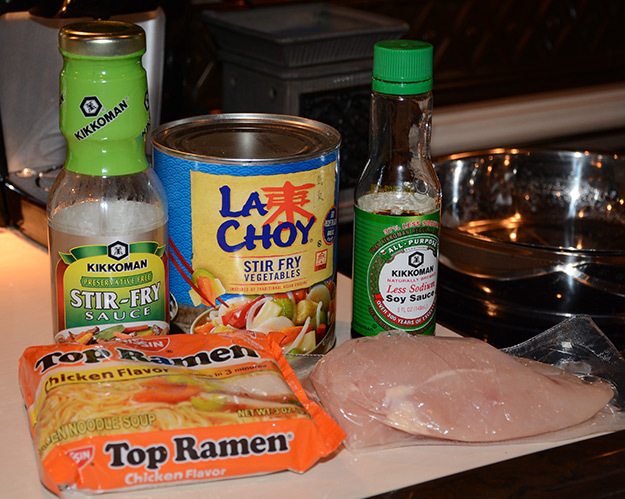 Once both were fully cooked, I put them in the pan and added a can of stir fry vegetables, stir fry sauce (found at the grocery store), low sodium soy sauce and add the entire packet of ramen noodle seasoning. I let all the flavors summer together on low heat for about five minutes and, TA-DA, a yummy dinner in 15 minutes with just five ingredients!